I have for the last couple of weeks once more been getting my eyes open for the herb called horsetail ,kjerringrokk in norwegian or Equisetum avensa, maybe because it is now growing in an even bigger abundance in my garden. I have used it on and off as it it used commonly in problems with the urinary system,like cystitis, kidney infections, removal of kidney and gall bladder stones and prostate problems. I have also used it as herbal combination for improving the skin,hair , teeth and nails. And as horsetail is a very potent herb in both acute and chronic cases and can be applied with success in very many common aliments . But I will here concentrate on the nourishment aspect of this herb which is why I now consider it to be one of the most important herbs to include in my daily routine. I had not really investigated it nor used it right from the garden, before this year. The reason why I have this year, apart from the fact that it now is invading my little wood,(one often say that the herbs you need, grow right outside your door...seems to be right!!) is that I have found out that horsetail is full of silica. And as I have learned about the importance of this very abundant mineral on this earth, and that even though it is so much of this mineral here, we tend to be deficient of silica in our body. Silica in our body, is extremely important for the health of our bones, skeletal system and connective tissues. It helps to fix the calcium so that the body can store more of this mineral to repair and build bone , collagen and connective tissue. It can therefor be of great value in relation to ie osteoporosis by building greater bone density and flexible bones, in contrary to brittle and porous bones,which is a great problem in Norway,these days. Curiously so, since we eat a calcium dominated diet. In Chinese medicine, there is the concept of Jing, witch refers to the substance that we inherit partly from our parents,and partly build up ,or break down, through our lifestyle and the food we eat (and unfortenately, we seem to break it down much faster than we build it up..). It is a substance that diminishes strongly as we age ,and when it is used up we die. Jing is very important for our bone health,the function of the brain and thereby our memory and nerve impulses ,as well as for our connective tissues (that hold everything in place in our body ) skin ,hair and nails. And it seems silica are one of the main ingredients for a strong supply of Jing in our body. 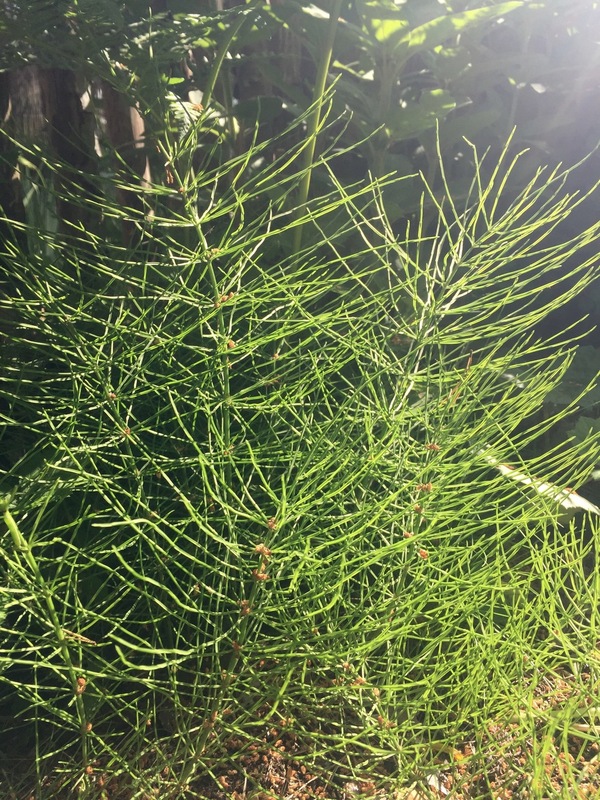 Horsetail is the living substance we know of with the highest content of silica, a mineral that we do not get in abundance from the other foods we eat. It belongs to the oldest living plant family on the earth, and it seems it feeds some of this very fundamental structures in us, as bones,connective tissues and the brain. And when we take horsetail on a regular basis,the silica in it gives us more energy and a feeling of lightness. And more flexibility both in a physical sense,as on a emotional level. There are several ways to take horsetail, and you can find several supplements in the health food store that you can take as capsules or tablets. Or you can buy the dried herb, or collect your own horsetail that you dry , and then make it into a tea or a powder. Tincture of this herb can also be of good use. If you are going to collect your own horsetail,be sure to collect the right one. It can be mistaken for others of the same family that are not recommended to use, like the Equisetum palustre el Myrsnelle in Norwegian or Equisetum pratense ,in Norwegian; Engsnelle. The horsetail or kjerringrokk, is quite easy to destinguish from the other ones, as it it's leaves are directed more upwards,the equisetum pratense/engsnelle,the leaves are flopping downwards,and the equisetum palustre is much narrower ,not at at all as wide and bushy. But to be sure,look it up before you go out to harvest. This is how you can make a tea of horse tail; take 2 teaspoons of the dried herb into one cup of water and boil up and then let it sit for 15-20 min. Drink one cup 3 times a day. Or you can grind up horsetail till it is a fine powder,in a mortar or a coffe grinder, and take 2 tbs into a cup of boiling water,and let it steep 10-20 min and sip it through-out the day. The taste of horsetail is not bad,but it may be even better to drink if you mix it with some other herbs,i.e. peppermint and some lemon. I have often mixed some pine-needle sirup with it , which makes it a very fresh and energizing drink. Keeping it in the fridge is important so that it doesn't start fermenting ,and I think drinking it cool makes it a very refreshing. Do not eat this plant in a raw form, as it contain enzymes that will block the absorption of vit. B.. By heat-treating or drying this herb this enzyme will be deactivated, and no longer be a problem.